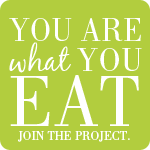 Welcome to the 8th recipe in the Food Matters Project. Evi and Sam chose this weeks recipe and you can see that take here. While I enjoyed working on this recipe I'm just going to come right out here and say, I don't like eggplant. I thought that maybe I didn't like eggplant as it has been a very hit or (a lot more of a) miss for me in the past. But I have faith in Mark Bittman and his cookbook so I went for it anyway. 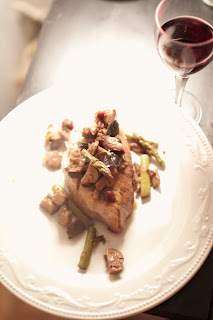 I love the wine and garlic and shallots and mushrooms and bacon and asparagus and chicken. I don't love the eggplant. Next time I make this I will cut out the eggplant and throw in some zucchini or additional asparagus. In a pan, on medium high heat, saute bacon til brown. Remove bacon and add a dash of olive oil. Add chicken breast, salt and pepper, and brown, turning periodically. Remove chicken. Add a dash of olive oil and the eggplant, shallots and mushrooms. Saute for 5 minutes and then add garlic. Saute for another 5 to 10 minutes or until vegetables brown. Add broth, wine, rosemary and parsley. Add asparagus and chicken. Bring to a mellow boil, and place lid on pan. Boil gently for about 15 minutes, or until chicken is done, but tender. Remove chicken, increase heat, and boil until roughly half of the liquid is gone and remaining concoction has thickened into a sauce. When I removed the chicken I placed it in a warm oven. So instead of adding the chicken back to the sauce to warm back up, I placed the chicken on a plate and topped with vegetables and sauce. I used asparagus too... Great minds! I told my guests after dinner that there was eggplant in it... ha, they couldn't even tell :) Seems like eggplant is a very hit or miss vegetable!